In Chapter 42 of the Holy Rule, it is recommended that between Vespers and Compline there should be some reading in common from "the Conferences [of Cassian], or the lives of the Fathers, or some thing else which may edify the hearers." "The Twenty-Four Conferences or Collations of St John Cassian, written in the early fifth century, were to have a tremendous impact in the West on the spirituality of monastics and other Religious. A classic of spirituality, they were compulsory reading for St Benedict's monks, the favourite spiritual reading of St Dominic in the late twelfth century and were treasured by St Philip Neri in the sixteenth. The Collations were likened by St John Cassian himself to the twenty-four elders of the Apocalypse, who lay their crowns before the Lamb. Whatever glory they have, they attribute it all to the Word of God made flesh, who speaks through them, as He speaks through Cassian their editor, and indeed, if God wills, through their translator Cassian and his companion Germanus interview a number senior monks and hermits, asking them about difficulties in prayer and in living the Christian life, and are given answers that display a surprising degree of psychological insight into human nature. Although these interviews were first written down for monks, there is much in them that can be applied to the spiritual life of all Christians. This new translation, by a Father of the Oxford Oratory, brings Cassian to life for the twenty-first century." At the monthly meetings in Oxford of The Sodality of SS Benedict and Scholastica, we are following the recommendation of St Benedict. 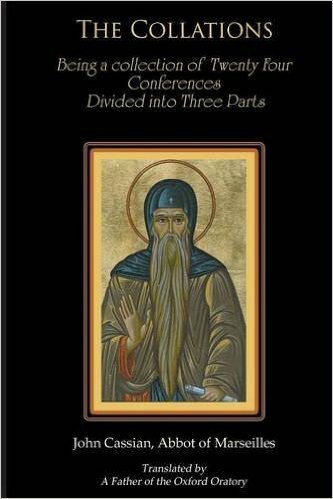 As part of our programme, we hear five minutes of reading from the Conferences of St John Cassian, and then later five minutes of commentary from one of the Fathers or Doctors of the church, on the Gospel of the day or of the previous Sunday. Meetings of the Sodality take place usually on the first Wednesday of the month, from 7pm to 8pm, at the Church of St Gregory and St Augustine in North Oxford.